The satellite image, which was captured by Sentinel-2A on July 9, 2018, provided by European Space Agency esa on July 18, 2018 shows a huge iceberg perilously close to the village of Innaarsuit on the west coast of Greenland. An iceberg that has drifted perilously close to a remote Greenland village is so big it can be seen from space. 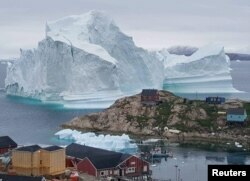 A giant iceberg is seen behind an Innaarsuit settlement, Greenland, July 12, 2018. The image captured July 9 by ESA's Sentinel-2 satellites also shows several other large icebergs in the vicinity.